Oh, do make some for sale! They are so wonderful. Oh My Goodness!!!!!!!! 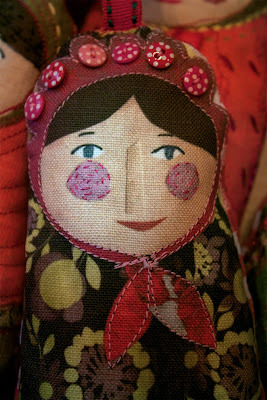 Just when I think you have done it all with your adorable doll fabric.......you make something so completely fabulous!!! I mean, REALLY girlfriend......you are just almost too darn talented for your own good!!! 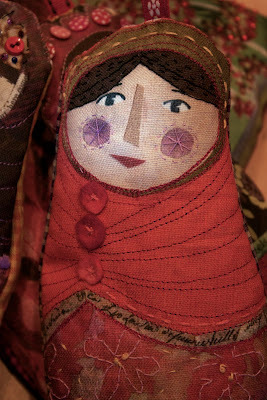 These lavender ladies are fantastic, especially after you embellished them with needle and thread and other goodies! DANIELLE! I SWEAR EVERYTHING YOU TURN YOUR HAND TO IS FABLULOUS. WHAT A DIFFERENCE A BIT OF HABERDASHERY MAKES! AND THEY WILL SMELL GREAT - IT DOESNT GET MUCH BETTER. You are remarkable and I agree with Di and Oolie - you are too good for your own good. I am in Austin - my mom says "hi"
These are adorable Danielle. Hope you are doing well .Miss you. Found your lovely Russian dolls on Pinterest. They are absolutely fabulous! Danielle - my beautiful scented russian dolly is the first objet to find a place in my new bedroom. In my view Russian Dolls - like puppies - are not just for christmas. I love her! Thank you soooo much.